Well, it has been a very busy week in Leslie World! I have finally finished up conferencing for a few weeks and boy am I glad. I don’t think I could have taken another 7 hour day with minimal chances to get up without disturbing everyone. At least at the office I can get up to go to the bathroom or walk around any time I need to. I am definitly getting to the point in my pregnancy where I can’t sit in the same place too long and heaven forbid I drop anything on the floor…it is quite an amusing sight:) Other than that I am feeling good and looking forward to a quite week behind my desk in the office. At home, Allen and I also had a busy weekend. We have been good little beavers and got a ton of stuff done around the house. I am very proud of us. We had beautiful weather and last night Allen hung out in our portable hammock and we started reading the new Harry Potter. The only problem with that scenario was that Allen fell asleep as I was finishing up chapter three. Oh well, he will just have to skim it tonight when he takes his turn reading aloud. I am also proud of the stitching I have done this weekend. I started out working on Nicole‘s neighborhood RR. I am very pleased that I will be more than on time this mailing. I am about two-thirds done with the block. I really like how it is looking so far! I will probably pick it up again tomorrow and hope to have it done mid-week. Well, I should go if I want to have time to stitch and read with Allen before bed. Hope everyone had a wonderful week. Looks great. Sounds like you are very busy. Hope you are enjoying the book. You have been a busy bee. You know, you are the only other person I know who enjoys having books read outloud to them by their partner. That’s what we do here and I love it (but I admit, we read in bed at bedtime and I usually end up falling asleep). It’s good practice for reading to the little ones lol. You’ve done some beautiful stitching this week. Your RR is very pretty. 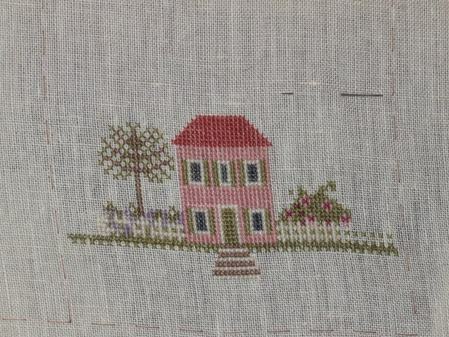 lovely stitching Leslie, and its good to hear that everything is ok with you, asides from all the busy-ness. Hope you have a good week too. Your stitching looks great. I’m looking forward to visiting your blog again. Congrats on your pregnancy, glad you are doing well. I’m actually due this week with my first little boy too. Oh gosh! I would love to see a pregnancy photo of you!!! You must look so cute!! Nicole’s RR looks wonderful – good choice!! And… wow, so nice to see Bordeaux again!!! Oh, they’re both wonderful! I’m glad you get to have a quiet week! You’ve really done a fabulous job on Nicole’s RR! Congrats on such a pretty baby boy, too!! Don’t you love seeing him on those ultra-sounds!? Nicole’s RR is looking fabulous! 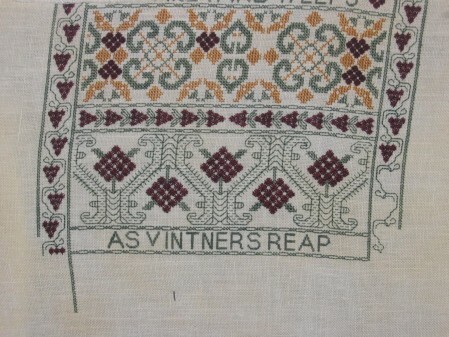 And congrats on making great progress on your Bordeaux Sampler – it looks amazing! Nicole’s RR is looking great, as is bordeaux. Thank for sharing your scan photos, I am glad that all is going well with your pregnancy. Both of your projects are looking lovely and I’m glad to hear your pregnancy is going so well!